There are many opportunities to Serve Christ in the World and in the church. See the overview below for Service ministries and Pastoral Care ministries at St. Peter & St. Paul. If you need support for yourself or others, read the descriptions below or contact the parish office at 770-977-7473. For more information, Click Here. and contact Rich Walker at [rhwjr214@yahoo.com]. This is a mobile food pantry program that we will host on the first Tuesday of each month for those in need of food and spiritual nourishment. The only cost of this ministry is your time – 4 hours a month from 9:30 am to 1:30. For more information contact Martha Davis at mghdavis@gmail.com or Merrilee Allen at meallen2000@gmail.com. We serve Christ in the World by providing transitional shelter and support for homeless families in Cobb County through the Family Promise organization. Family Promise coordinates a network of churches that rotate to provide shelter for a week at a time. For four separate weeks during the year, we house families in our church overnight, and provide them with dinner, breakfast and compassionate hospitality. The next week, they stay at another church in the network. During the day, Family Promise provides the adults with job training, financial counselling and support. They also provide the kids with a home base that insures that they can stay in the same schools during this transitional period. Family Promise is the only organization in Cobb County that provides homeless shelter for whole families (many others, at best, separate men and older boys from women and children). Families are screened for safety; they usually stay in the program for roughly six weeks before finding stable housing. After a brief training, you can get involved by providing food, helping to prepare rooms, serving breakfast or dinner, and being an overnight host at the church. 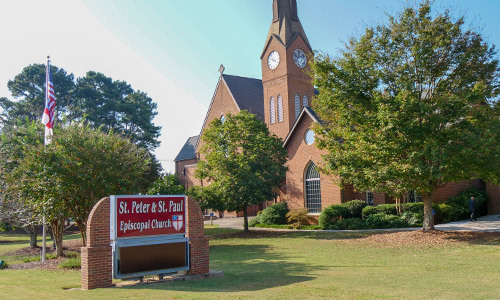 St. Peter & St. Paul provides pastoral care for those within and outside the church. See our Pastoral Care page for more information on Prayer Ministry, Pastoral Visits by Clergy or trained lay people, Transportation ministry to church services, Prayer Shawls for the sick or infirm, and a Card ministry for seniors and the homebound. If you need prayer, counsel or support, contact the parish office at 770-977-7473. There are numerous opportunities to serve Christ in the church: Worship ministries, Education ministries for all ages, Buildings & Grounds, Finance, Evangelism, and Stewardship. AA meets on Friday evenings at 8:00 PM in the Garden Room. For more information, contact the parish office at 770.977.7473. NA meets on Thursday evenings at 7:00 PM in the Choir Room. For more information, Click Here and contact Cheryl Leagan at cd.leagan@att.net. For more information, Click Here and contact Peter Williams at peteingridw@gmail.com. For more information, Click Here and contact E.V. Bennett at eloisevwall@gmail.com and Merielle Struchen at mstruchen@gmail.com. For more information, Click Here and contact Carol Bowser at carolbowser@comcast.net. Our youth Ministry is also involved in Domestic and International Mission work. See Youth Ministry for more details. We provide compassionate care to those who care for others. If you are caring for a spouse or parent or child with a chronic condition, then you need support as well. We meet for lunch on the second Thursday of each month and share struggles and blessings in a supportive environment. For more information, contact The Rev. Elisa Harres at eharres@peterandpaul.org. We can walk with you in your grief through the support of the clergy, Stephen Ministry, or our Grief Share program. We provide Compassionate Care to those grieving the death of loved ones in a weekly support group. GriefShare uses a video and workbook in their 13-week program supporting people in their grief journey. We provide compassionate care through trained lay people that meet one-on-one with care receivers. Stephen Ministers are trained and supported in this confidential ministry of walking alongside those who are facing one of life’s crises, such as grief, job loss, stress or illness. For more information, Click Here, and contact Maria Manning at mariamanning60@yahoo.com.